Mr H first came to Surbiton Smile Centre in 2006 with a loose bridge. He was a smart-looking gentleman, but seemed shy and avoided smiling. His teeth had been damaged in a rugby game several years previous – his front teeth were shunted forward and he had lost a tooth on the upper right side, which had been replaced by a cantilever bridge supported by his top-right canine. Unfortunately, the canine was fractured and the entire bridge came out. His upper-left incisor was infected and needed to be extracted, and Mr H also clenched his teeth, which wore down the surfaces of all his teeth. Taking time to talk with Mr H, he revealed that he didn’t like his teeth. He said that he tried to stop himself smiling and made sure to keep his lips closed when he talked. Mr H asked me if there was any way to improve the look of his teeth. He had not smiled for a long time. 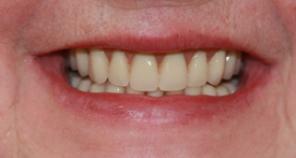 I assured him that it was possible to restore his teeth and give him, once again, a healthy, natural smile. Mr H and I worked closely together to devise a cost-effective personal treatment plan that took into consideration his wishes and budget. It was to be a multi-disciplinary procedure, which would require long-term commitment from Mr H, but that would in the end fully reconstruct his mouth. Typically, the first stage of a long procedure is to improve general oral hygiene, starting with our dental hygienist training Mr H in preventative care. 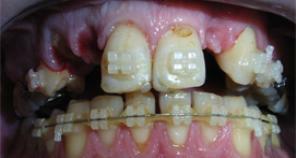 Then, the upper-right canine and upper-left incisor were extracted, and the decayed and damaged teeth restored. 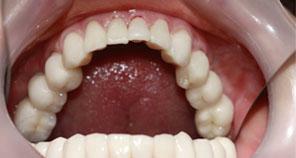 The second stage involved orthodontist treatment to straighten the teeth and align them in the upper and lower jaw. 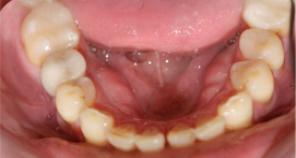 Good oral hygiene was maintained during this period by visits to the hygienist every three months. Mr H wanted to keep his healthy teeth intact and only replace the missing teeth. Building another bridge would have required shaping the teeth adjacent to the gap, so according with Mr H’ wishes we positioned implants for his missing teeth. 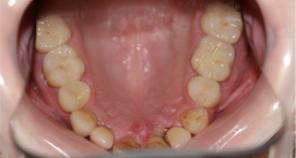 In the fourth and final stage, three crowns were placed on the implants and the back teeth were reconstructed. Due to his clenching and grinding, and a large filling, they had worn unevenly and given him an unbalanced bite. It was crucial to stabilise Mr H’ bite to reduce the risk of overload on his teeth and new implants. Excessive load can cause implants to fail or teeth to break. We provided Mr H with a personalised mouth guard to wear at night, which would relax his jaw muscles and help him to reduce the grinding and clenching. 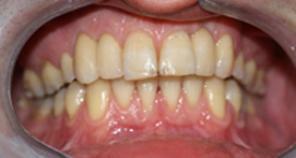 All his back teeth were restored with metal-free ceramic crowns. Mr H is an amazingly cooperative patient. His treatment now over, he regularly attends the hygienist four times a year and comes twice year for a routine dental check-up. It is a great feeling for our team at the Surbiton Smile Centre to see this nice man smiling once again with confidence, meeting our eyes and facing the world with pride. Mr J is a special case. He has been coming to Surbiton Smile Centre to see Dr. Soltani since 2003. Mr J had problems with decay and grinding his teeth. A smoker, his condition was made worse as his saliva secretion was next to nothing. 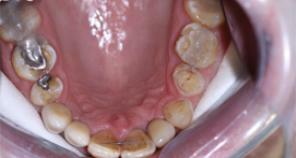 These additional risk factors made Mr J more prone to tooth decay and erosion. To begin to restore his teeth to health, we needed to find out what was going on. Firstly, Mr J went to see hygienist to improve his general oral hygiene. A saliva test showed that his lack of mouth moisture was a severe problem. We asked him to cut down on his smoking and drinking, and rinse his mouth twice day with fluoride mouthwash. Over a course of a year, this would strengthen the tooth enamel. A blood test at his GP also revealed Mr J had a liver problem. We drew up a personal treatment plan in consultation with Mr J to boost his confidence and improve his social life. His decayed teeth would be restored over several years, a course of action that required considerable co-operation from the patient. He only wanted to restore his upper jaw, so we kept the upper-left canine and with orthodontist treatment brought the upper teeth forward, making plans to increase his bite and the height of the teeth. We made a personal mouth guard for him to protect his teeth from grinding and allow the teeth to move forward in both his upper and lower jaw. These measures managed to increase Mr J’s bite, giving him an extra 2 mm. 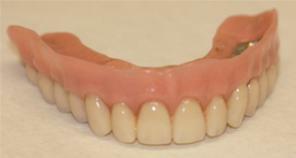 Mr J’s new upper teeth were designed on a wax model. To accommodate the longer teeth, we needed to reshape his gum as well. We made him a set of temporary crowns, which he wore for several months to get used to his new bite height. At this stage, we could alter and adjust his crowns until Mr J was happy with his new teeth. He had regular check-ups on his oral hygiene and we monitored how he was getting along with his new teeth. 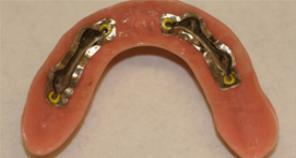 After 9 months, we took a final impression and built new crowns from metal-fused porcelain. On the lower-right side we placed an implant to provide him with a better chewing platform. 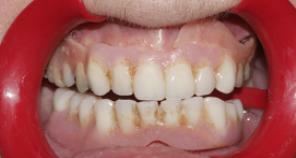 With this type of case, treatment continues with a good programme of daily dental hygiene. With a good diet, good saliva flow and cutting down on fizzy acidic drinks, Mr J can expect to keep his new teeth for many years. 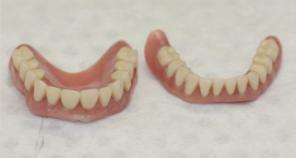 Mrs W’s denture had become loose because of bone loss in her jaws. There was not sufficient bone to hold her denture in place and she couldn’t eat comfortably. Because it constantly threatened to fall out, socialising was embarrassing for Mrs W and she was very unhappy. 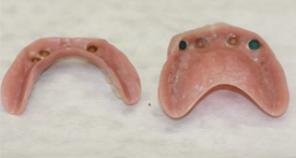 The only solution was to build a new implant-retained denture for Mrs W. With our dental expertise and technical knowledge, we fixed with four implants in her upper jaw and three implants in her lower jaw, as well as making the new dentures. 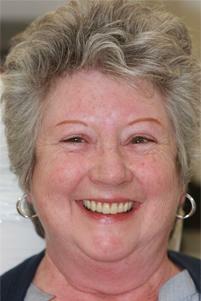 With them snugly fitted, Mrs W looked happier and healthier with fewer wrinkles around the mouth. Now she could eat everything without any stress, talk and smile with confidence, and socialise in comfort. Her life is revitalised and she shines when she smiles. Mrs W has had her denture for the last three years and still attends the dentist for her annual check-up. It is great feeling for the Surbiton Smile Centre team to see how our efforts and care improve the quality of our patient’s lives. 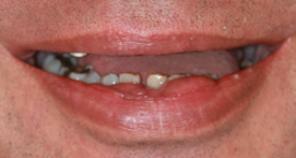 Mr J came to us asking for nice solid teeth, fixed in place. Before we could begin implant treatment for him, he needed periodontal treatment in his lower jaw. We also needed to work with him to stop smoking. He was really positive and cooperative and together we spent several sessions treating his gum disease. 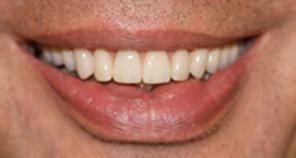 Mr J was referred to hygienist for regular maintenance and managed to stop smoking before his implant treatment. The solution we developed for Mr J was both sophisticated and elegant. 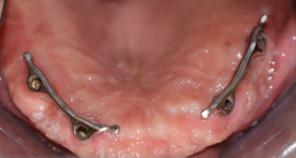 After four months, he had two implants placed in his lower jaw and four implants in his upper jaw. The upper jaw implants were constructed with a bar, and a beautiful and comfortable denture without a palate was made to click onto the bar. Mr J’ confidence came flooding back – the change is remarkable. It gives us great pleasure to see the boost that high-quality dental treatment brings our patients, allowing them to regain their happiness and confidence. The form and the shape of our teeth have a fundamental impact on facial harmony and, as a result, our confidence. Ms Z, a beautiful Romanian woman, didn’t like the way her teeth looked. Her front teeth were root-filled and built up with filling, which affected the harmony of her face. Due to root filling, Ms Z’s teeth were slightly dark, and the shape and the shade of her teeth interfered with her lovely face and bright personality. Our dental treatment masked the dark shades with an opaque material, and Ms’s teeth and beautiful smile were restored with two metal-free ceramic crowns.